So as promised more coffee cake. But I do have to print a retraction. A while ago I mentioned here that I was on a coffee cake kick. And I have baked a fair few coffee cakes lately getting recipes right, but after all of it my coffee cake urge seems to be satisfied. Which means: the coffee cake thing just doesn’t qualify as a “kick” after all. I’m sure coffee cake will turn up around here again, but no barrage of recipes for it as you may have been expecting. 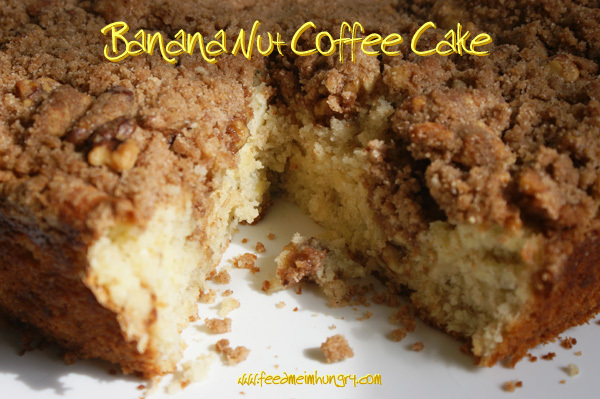 This coffee cake came around because I had a bunch of bananas getting to ripe that I didn’t want to waste. The usual thing to do with too ripe bananas is make banana bread of course, but I just wasn’t feeling it. So I figured why not try tossing them is a coffee cake, it’s different, it sounds like it will taste good. And indeed it does! So if your a banana/ banana bread lover this one is for you. The banana flavor is assertive in this cake, which I think is nice. 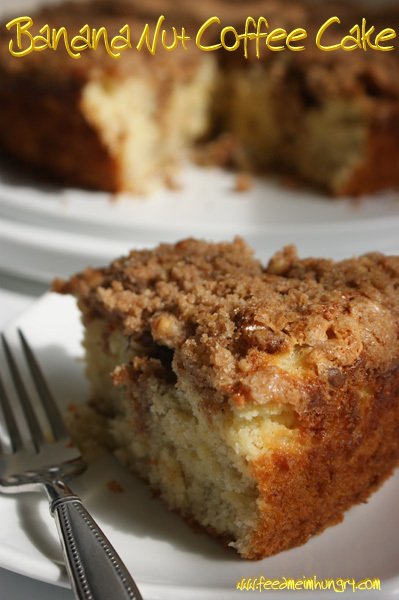 But you still get that classically delicious coffee cake thing going on too. Give it a shot next time you have too many bananas sitting around and enjoy! Preheat oven to 350*. Grease and flour a 10" spring form pan. In a large mixing bowl cream together the 1 stick butter and 1 cup of sugar. In a separate bowl sift together 3 cups of flour and 4 TBSP baking powder. Add this to the butter sugar mixture. Set aside the empty bowl. Add the cup of milk, two eggs, and bananas. Mix all of this together until well combined. Pour 2/3 of the cake batter into the spring form pan and set aside. Reserve 1/3 of the batter to mix with the cream cheese mixture. Take the reserved 1/3 of the cake batter, add 8oz cream cheese, 1/2 cup sugar, 1 egg, and 1tsp vanilla extract. Mix well. Pour this mixture on top of the cake batter already in the spring form pan. Set aside again while making the crumble topping. In the empty bowl set aside earlier, partially melt the remaining 1/2 stick of butter. Add the 1/4 cup flour, 1/2 cup sugar, 1 TBSP cinnamon, 1/4 tsp allspice, 1 cup walnuts, and 1 tsp vanilla extract to the bowl. Use a fork to mix until a medium sized pebbly mixture is formed. Add the crumb mixture to the top of the cake batter in the spring form pan. Press slightly so that the mixture adheres to the batter. Bake at 350* for 45-50 min. A fork will come away clean and the crumb topping will be browned. Allow to cool well before removing from the spring form.